Fire almost completely destroyed this residence at 71 Wairere Road, Walnui, when it mysteriously caught alight on a recent Saturday night in the absence of its owner, Miss E. Keogh. 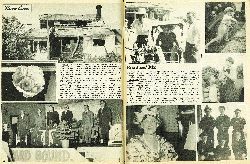 The Giaborne Fire Brigade fought the fire, using water borrowed from neighbouring houses, for two hours before bringing it under control. This giant Iceland poppy (compare with ruler) was grown from an Australian seed by Mrs J. L. Kape of 680a Gladstone Road. 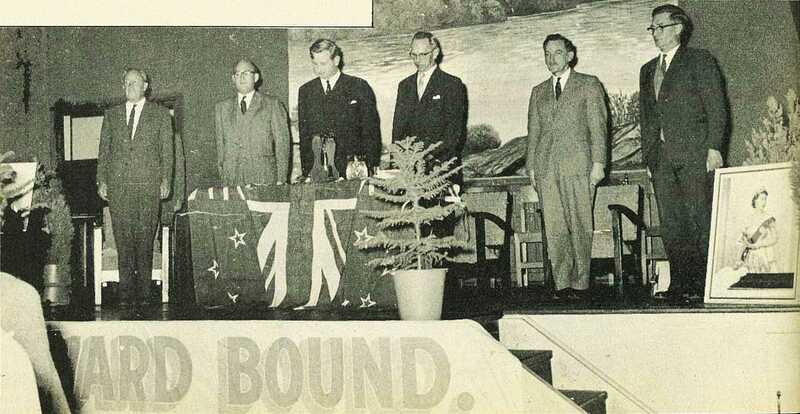 The official party at the public meeting held in the Boys' High School assembly hall at which a branch of the Outward Bound movement was formed, are, from left: Messrs. A. J. Gray (Boys' High principal), O. P. Barnett, Hawkes Bay (trust council), H. Thomas (Warden of Outward Bound school, Anakiwa), the Mayor, Mr H. H. Barker (chairman of meeting), H. Douch (branch president), and D. A. Clarke (Public Relations Officer).